We generally talks about how to increase blog traffic and how to get good alexa rank .But we forgot about bounce rate.Normally so many people dont know what is”blounce rate”. Bounce rate is nothing but a factor that involves in your blog to measure your blog users performance as well as your blog performance.In simple words if your blog getting daily 1000 visitors,but visitors are not going to another pages of your blog your blog bounce rate will increase automatically.if your blog visitors are opening another pages in your blog, your blog bounce rate will decrease.So try to engage your audience to open another pages in your blog.It will be good for your blog. Here iam giving some tips to decrease your blog’s bounce rate.By following this tips we can maintain our blog’s bounce rate constant. First impression is best impression.So remember this word. Maintain your blog design clean and user attractive.another thing is loding time of your blog .When user landing on your page if it takes more time to load he can’t show interest to be on your blog.So be sure your blog does not take much time to load.If your blog taking much time to load you may loose your new or returning visitors.You can use website speed test tools to check your blog loading time and performance. Your blog must have easy navigation system.Means you must divide your articles according to the topics.It will be make more easy to the users to find topic in your blog what they want.By using this ,users can move one page to another page according to their requirement.So try to use this feature. Creat a search box in your blog.It will be easy to the users to find relevant topic in your blog. This is also very important factor to decrease your blog bounce rate.Try to interlink your posts as much as with relevant topics.This helps to the users to find releted topics within the page.This is also helps to boost your blog ranking.This will increase your users average time spending in your blog. 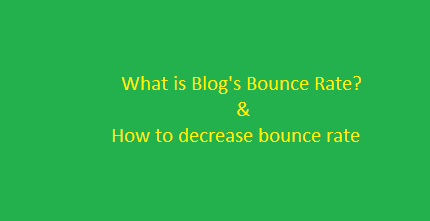 “I hope this article will helps you ,And try to decrease your blog bounce rate.If you have any other factors that regarding to decrease blog’s bounce rate, Feel free to share with us as a comment.